Sales teams no longer need to be bound by static pipeline views that are just that — views. 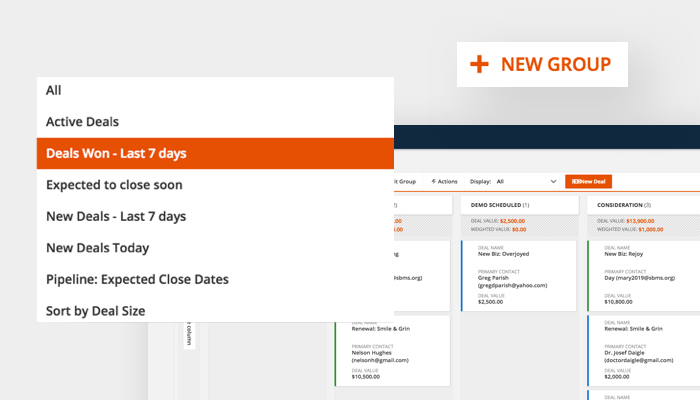 With ONTRAPORT’s new Deals and Companies feature, sales reps can not only see their entire pipeline at a glance, but they can also set in motion automated follow-up for their prospects with a simple drag and drop. Taking it steps further than passive, stagnant pipeline displays, ONTRAPORT’s full sales force automation suite and built-in email, SMS and task functionality make the Deals and Companies feature a one-stop shop for sales teams to organize and manage their entire sales pipelines. The feature comes packaged with all the standard settings that sales teams use to oversee their deals and companies in the pipeline, yet it’s also fully customizable — a unique capability due to ONTRAPORT’s flexible system. Each piece of the Deals and Companies feature was built intentionally to support sales teams in easily accessing the information they need to reach their sales goals, while also taking care of manual tasks that eat away at sales reps’ time that would be better spent in conversation with leads. Teams can get up and running quickly using the pre-configured Deals and Companies records, as well as the pre-built pipeline views, automated campaigns, and more. 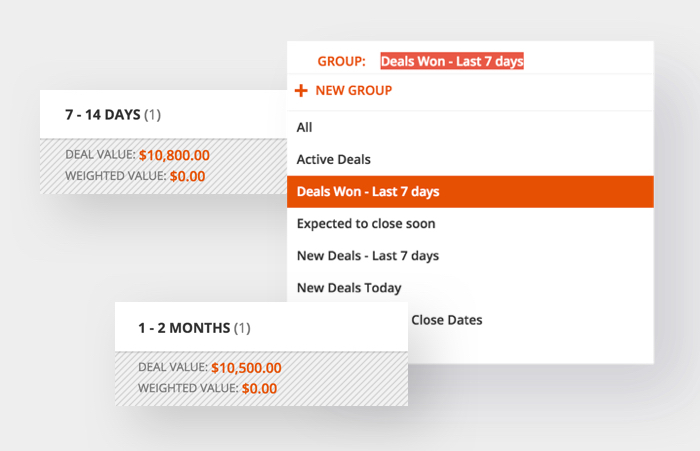 Created with sales teams in mind, the Deals cards include the essential fields such as “Deal Value” and “Expected Win %” and automatically calculated “Weighted Deal Value” as well as views for pipeline forecasting, viewing leads by sales stage and more. Companies cards include fields such as “Industry” and “Annual Revenue” and also house all the deals and contacts associated with the company for optimal organization. 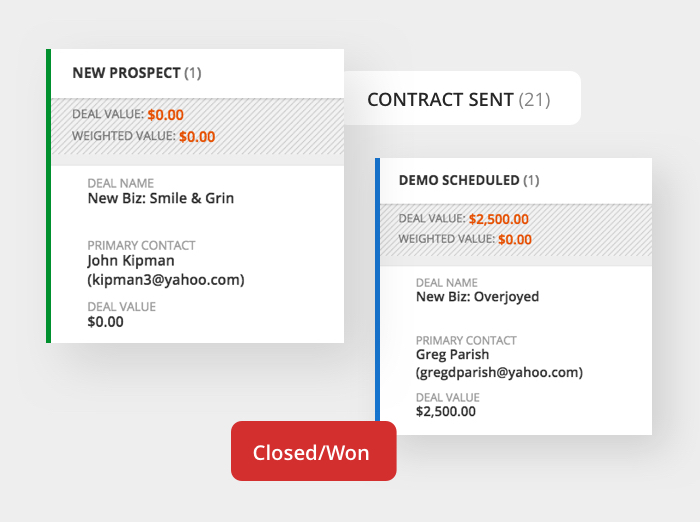 The pipeline view is pre-configured with stages representing a prospect’s status as they progress from “new prospect” to “qualified lead” to “closed (won)” and “closed (lost)” and beyond, and these stage names can be edited or rearranged to match the terminology or steps any sales team uses. In addition to the readymade cards and pipelines, the Deals and Companies feature has built-in settings for calculating important data such as deal value and weighted deal value so teams can easily gauge progress toward quotas. 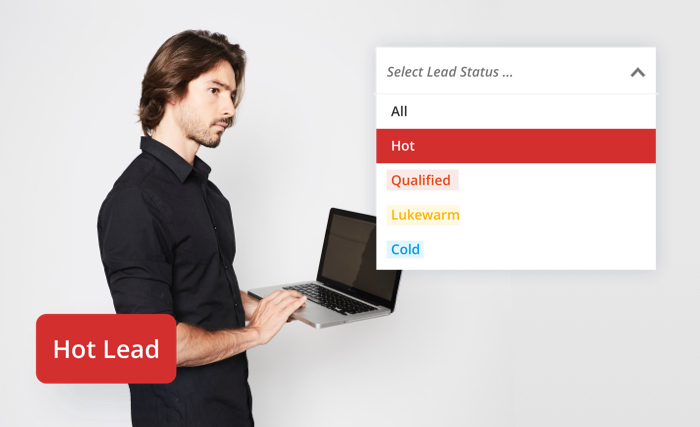 It has color-coded cues so sales reps can instantly zero in on the deals that are hottest, biggest or otherwise of utmost priority, and it has group filters to show deeper-level insights into the pipeline status. These numbers give sales reps and managers critical insight for assessing progress, forecasting results and prioritizing deals. The system is set to automatically calculate these numbers based on the “Deal Value” and “Expected Win %” fields that are within each Deals card, and the results are displayed at the top of each stage in the pipeline for quick understanding. Sales reps often have more leads to follow-up with than they have time in the day. Visual cues such as colors make it much faster for team members to see the status of each deal and understand where to focus their efforts. The Deals and Companies feature cards come with color coding to indicate deal size, the time that has passed since last contact, and activity level. The color coding is also completely configurable, so you can tailor your pipeline view to highlight whatever is most important to your team. Sales reps and managers can also filter the pipeline view to show, for example, only deals won in the past seven days or only deals expected to close soon, to gain a bigger picture understanding of the status of their pipeline, forecast results for budgeting and resource planning, and uncover the team’s greatest opportunities to reach their goals. Putting everything together, Deals and Companies come with fully created campaigns that run behind-the-scenes to automate the updating of important data and move the cards through the pipeline. The campaigns serve to continually update information, such as time since last activity, weighted deal size and actual deal close date. That information adjusts the colors and group filters to again provide quick and easy access to critical information that informs data-driven decisions. To give team members ongoing estimates of when a deal is expected to close, this campaign continually updates the close timeframe as time passes. This campaign simply adds the deal’s close date once it is moved to the “closed” stage of the pipeline. This comes in handy when reviewing sales results and for reference in subsequent sales conversations. This campaign is designed to show team members which of their deals are going cold and also to alert team members in real time when cold deals become active again, indicating it’s a prime time to reach out. This campaign assigns colors to cards so team members can quickly understand the monetary value of the deal. Sales teams often use weighted deal value to forecast their expected revenue each month or year. This campaign automatically calculates this value for quick access. 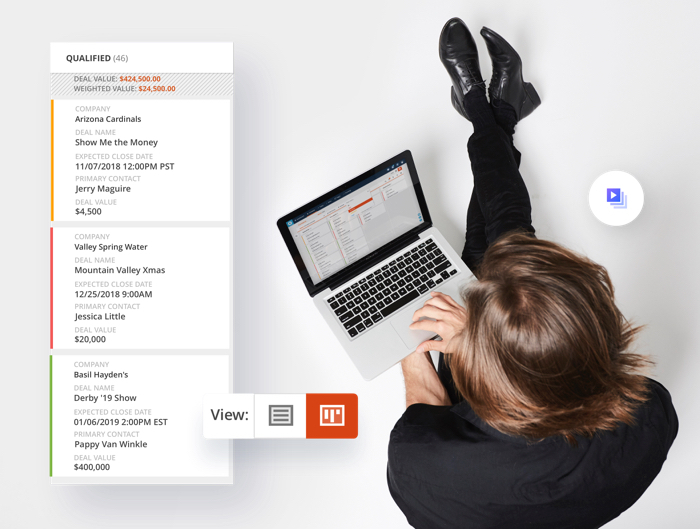 With these Deals and Companies systems seamlessly working together with automated campaigns, sales teams have everything they need to manage their daily priorities and set themselves up for better results. Angela Fornelli is a writer and editor with over a decade of experience covering the healthcare, aviation, and technology industries. A Chicago native, she currently serves as ONTRAPORT's managing editor and has a Bachelor's in Journalism from the University of Illinois.